Mall anchor J.C. Penney (JCP - Get Report) reported disappointing earnings on Aug. 11, as its turnaround story faded into the sunset. As earnings approached, the stock closed below the important $5 threshold on Aug. 10. On Aug. 18, the stock set a new all-time intraday low of $3.45. My monthly and semiannual value levels are $2.31 and $2.17, respectively, where J.C. Penney is a buy as an "option on survival". Option on survival means: If you buy a stock between $1 and $3 a share you are betting that the company will survive and its worth the risk of owning at that low price. This is a concept I developed in my many years of working with stock brokers and their clients who want to speculate that a low-priced stock is worth the risk. When J.C. Penney fell below $5 a share, warning flags were waving, as many brokerage firms do not allow investors to own a stock trading below $5 a share on margin, where an investor owns the stock, not fully paid for. When this occurs, the investor must either make up the full purchase amount, or sell the stock. Margin call selling is a negative for a stock as it's difficult for it to climb back above the $5 threshold. J.C. Penney has been below a "death cross" on its daily chart since Nov. 9 when the stock closed at $8.36. A "death cross" occurs when the 50-day simple moving average falls below the 200-day simple moving average, and indicates that lower prices lie ahead. This bearish signal remains on the chart Monday. However, when a stock falls between $3 and $1 a share, it becomes an "option on survival." J.C. Penney closed at $3.60 on Aug. 18, down 56.7% year to date, and deep in bear-market territory, 66.5% below its post-election high of $10.74, set on Dec. 8. The stock set its all-time intraday low of $3.45 on Aug. 18. 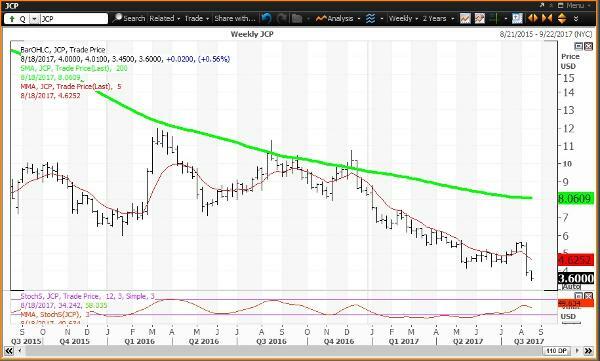 The weekly chart for J.C. Penney is negative with the stock below its five-week modified moving average (in red) at $4.63. The stock has been below its 200-week simple moving average (in green) since the week of Dec. 16, when this average was $9.70. This "reversion to the mean" is now at $8.06. The 12x3x3 weekly slow stochastic reading declined to 49.63 last week down from 57.33 on Aug. 11. Investment strategy: Buy weakness to my monthly and semiannual value levels of $2.31 and $2.17, respectively. Remember that buying a stock between $1 and $3 a share is an "option on survival". Sell strength to my weekly and quarterly risky levels of $4.63 and $6.84, respectively. Where Did You Get Your Solar Eclipse Glasses?